The BAPS (Bochasanwasi Akshar Purushottam Swaminarayan Sanstha) Shri Swaminarayan Mandir in Robbinsville in Central New Jersey, USA, is the largest Hindu Temple in the world. This Hindu Place of Worship spread in a 162 acre land built by the BAPS Swaminarayan Sanstha with a cost of $18 million was consecrated by Pramukh Swami Maharaj on 10th August, 2014. Since Many other associated constructions are still in progress, Akshar Dham, Robbinsville, shall finally be inaugurated on the 100th Birth Anniversary of Pramukh Swami Maharaj in 2021. The BAPS Swaminarayan Sanstha, which is headed by Mahant Swami Maharaj, is a denomination of the Swaminarayan branch of Hinduism. The “Mandir” is a type of "Shikarbaddha" “Mandir”, built according to principles laid out in the Shilpa Shastras, Hindu texts prescribing standards of sacred architecture. Within the “Mandir” ‘murtis’ (sacred images of the deities) have been ritually installed. The central shrine holds the ‘murti’ of Swaminarayan, with Gunatitanand Swami to his left, together worshipped as Akshar-Purushottam Maharaj. Similarly, different shrines hold ‘murtis’ of other Hindu deities such as Radha Krishna, Shiva Parvati, Sita Ram, Hanuman, Ganapati and the lineage of BAPS gurus who are Swaminarayan’s spiritual successors. According to Hindu beliefs, once the divine has been invoked in a “murti”, it becomes an embodiment of the Divine. Accordingly, Swaminarayan sadhus (monks) offer devotional worship to the deities throughout the day. Before dawn, they awaken the deities by singing morning hymns (prabhatiya). The deities are then bathed and offered food and garments depending on the time of the day and season. Food that has been offered to the deities is considered sanctified. These holy offerings are distributed to the devotees as prasadam. ‘Aarti’, a ritual where devotees sing the glory of God while a lighted wick is circulated before the murtis, is performed five times a day and named `mangala aarti’, ‘shanagar aarti’, ‘rajabhoga aarti,’ ‘sandhya aarti’ and ‘shayana ‘aarti’, respectively. Food is offered to the deities throughout the day. Finally, ‘sadhus’ adorn the ‘murtis” with night garments and ask the deities to retire for the night. The BAPS Shri Swaminarayan Mandir in Robbinsville, New Jersey was first proposed and envisioned by Pramukh Swami Maharaj in 1997 as a part of Swaminarayan Akshardham in North America. The “Mandir’s” construction commenced in 2010, The ‘Mandir’ was built in the ‘Nagaradi’ style according to guidelines outlined in ancient Vedas, or Hindu scriptures using 68,000 cubic feet of hand-carved Italian Carrara marble, Turkish limestone and Indian pink stone. The marble obtained from quarries in Europe was shipped to Rajasthan, India where hundreds of artisans carved the stones. After the finished pieces of stone were assembled at workshops in India, engineers sequentially numbered the pieces, which were then packed and sent to Robbinsville. 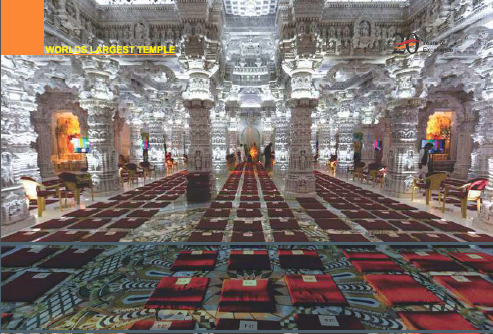 Upon their arrival, the pieces were organized using the numbering system to facilitate the mandir’s construction. In addition to the ‘mandir’, the complex includes a congregation hall. A decorative ‘mandap’, or enclosure, was built around the ‘mandir’ to shield the it from harsh weather and facilitate its year-round use. The structure is 87 feet wide, 133 feet long and 42 feet high. The entrance to the mandap, called the Mayur Dwar, contains carvings depicting peacocks, elephants, and celebrated Hindu devotees of past eras. The ‘Mandir’ was constructed primarily through the efforts of volunteers. Volunteers assisted in construction, daily site cleaning, and preparing food on a daily basis for the Indian artisans who worked on-site. The craftsmen and volunteers provided an estimated 4.7 million human hours to complete the ‘Mandir’. Volunteers were engaged in various tasks during the construction process. This consisted of design and engineering, carving coordination and stone shipping, site preparation, lighting and electrical wiring, polishing, cleaning the assembled marble, tent-building, meal preparation and offering medical services. The temple is visited daily by a large number of people residing in New York. It is also flooded with devotees with their families from other parts of USA on Saturday, Sundays and on religious occasions.